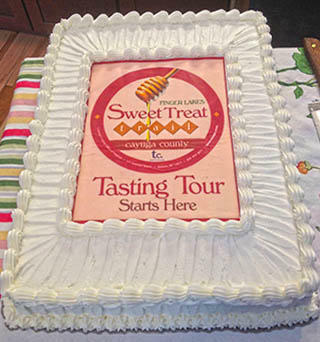 April 25, Cayuga County, NY – The 2016 Finger Lakes Sweet Treat Trail Tasty Tour will kick-off on May 6th from 5 – 8 pm at Theater Mack behind the Cayuga Museum, 203 Genesee Street, Auburn as part of First Friday, a community open house coordinated by the Auburn Downtown BID. This farmer’s market style event is free and family-friendly, offering samples and tastings of locally produced baked goods, jams & jellies, honey and maple syrup from many of the 21 sweet spots on the Trail. A variety of Sweet Treats tastings and coupons will be provided by Karen’s Country Confections, Bradford Heights Delights Marketplace, Strawberry Fields Hydroponic Farm, Reese’s Dairy Bar and many others. Products will also be available for purchase if you want to take some of your favorite sweet treats home with you.